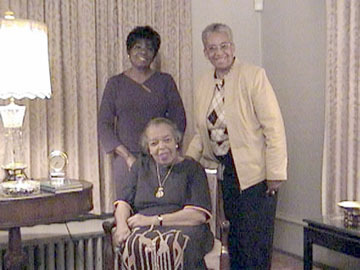 Peggy Brooks-Bertram (standing to left) and Barbara Seals Nevergold (standing to right) visit Gwendolyn Greene (seated) in her home during an interview for the Uncrowned Queens Digital Oral History Project. Drusilla Dunjee Houston, after whom this web site is named, would often describe her meetings with outstanding women and men in Oklahoma as engaging in "mountain-stepping." Indeed, meeting with and recording the oral histories of Uncrowned Queen octogenarians Gwendolyn Greene and Eva Noles was truly "mountain stepping." On November 3, 2005, Barbara Seals Nevergold and I (Peggy Brooks-Bertram) began meeting with women selected for the Uncrowned Queen Digital Oral History Project. The purpose of this project is to capture the oral histories of African American women, in their 70's and 80's, preserving the collection and making the interviews accessible from a dynamic Web exhibition - the first online, audio/visual, digital techno-pedia. The project began with the interview of Uncrowned Queens Gwendolyn Greene followed by Eva Noles. The initial goal is to collect and preserve the oral histories of 10-15 Uncrowned Queens who are septuagenarians and octogenarians. Secondly, the project will create a multi-media online exhibit accessible as links from both the University Archives Web site and Uncrowned Queens. The Web site's components will include edited versions of the interviews, interactive study questions for educators and students, and a dynamic virtual guest book feature where visitors to the exhibit can add a response to the exhibit. These oral history interviews are the beginning of a permanent, dynamic online exhibition focusing on the oral histories from African American women identified as Uncrowned Queens of Western New York. This project connects the University with far broader audiences because as a digital online oral history project it has wide applicability and will provide a prototype for future similar oral history projects. It will also enrich historical understanding in public memory by promoting historical skills and services. We are privileged to be able to conduct the Interviews in the homes of the Queens. Here they took the opportunity to make available any and all documents, photos and other materials that they wanted to share. We were not disappointed. First, we were most impressed with the willingness of the Uncrowned Queens to share personal and professional information about themselves and their families. Personal attributes of the "queens" were also both impressive and illuminating. Each had a vivid memory of events and the detail of the events was extraordinary. They talked about the obstacles in their lives and how they overcame them. It was curious to see that little was made of the obstacles as they focused more on their triumphs over obstacles. They encountered many problems and one of the most frequently referred to social problem was racism. It was interesting to see that each individual experienced racism differently. Consistent with the data in Vol. II of Uncrowned Queens, African American Women Community Builders of Western New York Uncrowned Queens have a long and rich history of Church involvement. This is matched only by their involvement in Black women's social clubs and organizations. All share a deep appreciation and love of higher education. Each has a long record of community activism and love for the African American community. This is only the beginning of our journey into the oral memoirs of these extraordinary women. In our next update on this project, we will share with you some of the names, places and organizations remembered by these extraordinary women. Perhaps you will remember them also.